Eilif Hellum Noraker ... Thor Jr.
Edward Kling ... Erik 7 yrs. Epilogue: Bengt fell in love with Polynesia. He settled there and became a Consul General of Sweden. He died in 1997. Epilogue: Erik built himself a sailboat, that became his home for 11 years. He worked as an artist until his death in 1972. Epilogue: Torstein kept going on expeditions. He died in 1964 during an attempt to reach the North Pole on skis. Epilogue: Knut resumed his career in military intelligence. He was also instrumental in the establishment of the Kon-Tiki museum. He died the Christmas of 2009. A longer walking-toward-the-foreground opening shot (2:08 min), with an almost-post-drowned extension (0:12) at the end of that scene. Extended scenes: pineapple (0:06), jungle-night-trek (0:04), waiting-in-lobby (0:12), publisher-interview (0:10), NY-apartment (0:16), phone-conversation (0:40), meet-the-crew (0:13), raft-loading (0:26, includes introduction of the envelope), and more. End-credits are also different: Norwegian runs for 5:24, English for 6:41 min (due to additional English credits). Q: What kind of spotted shark did they encounter? Q: How long was the Kon-Tiki at sea? Q: How far is Peru from Polynesia? During the 20th century some individual achievements so captured the popular attention as to become iconic: Lindberg's flight across the Atlantic, Hillary and Norgay's conquest of Everest, Roger Bannister's four minute mile. Thor Heyerdahl's 1947 voyage across the Pacific was one of these events. His book, Kon-Tiki, sold tens of millions of copies, and his 1950 documentary won an Academy Award, as much a recognition of the feat as the film. Norwegian directors Joachim Rønning and Espen Sandberg have now decided to put on the screen a dramatized account of Heyerdahl's expedition. But the obvious question is how can you make interesting the story of six men confined to a small wooden raft for 101 days? In fact by comparison to the exploit it recorded, the original documentary came across as rather bland, precisely because of such limitations. But this new film is anything but tame, and succeeds in combining striking photography of the adventure itself with a compelling look at one man's quest to show that "it can be done." Heyerdahl had developed this premise much earlier, but after World War II, he made serious attempts to secure the backing for a voyage that would test his theories. Not only did he encounter opposition from those who felt that he was wrong, but even more often he was dismissed as a fanatic with a suicidal plan. Eventually he did manage to scrounge some backing, including private loans, help from the Peruvian authorities and supplies from the U.S. Navy. Perhaps more importantly, he found five companions who had confidence enough to put their lives in his hands. All were Norwegian except Bengt Danielsson, a Swede with an interest in migration. Erik Hesselberg was the navigator. Knut Haugland and Torstein Raaby, both heroes of the Norwegian resistance, were the radio experts. Herman Watzinger was an engineer who helped design the raft, and who recorded much of the voyage's scientific data. Although he took along modern equipment, Heyerdahl was concerned that the raft itself should be constructed only from materials that were available in ancient times. Accordingly the raft was constructed from logs tied together with rope, surmounted by a thatched cabin and a large cloth sail. The raft itself was about 45 by 18 feet (13.7 by 5.5 m), and the cabin about 14 by 8 (4.2 by 2.4 m). The crew sailed from Callao, Peru, on April 28, 1947 and arrived in Raroia in the Tuamotu Islands on August 7. The film succeeds by contextualizing these 101 days at sea against Heyerdahl's struggles to get the expedition underway. 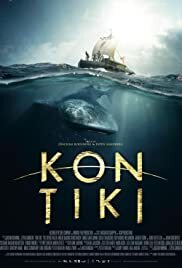 Although the inevitable storm and the equally foreseeable shark attack have their moments, the movie similarly attends to the relationships among the expedition's six members, their level of bonding to Heyerdahl as leader, and his own relationship with a wife who wanted to be supportive, but who found the risks unacceptable. It establishes the overall context by its early sequence dealing with Thor's honeymoon stay in the Marquesas, where he began to discover the apparent Inca connections that led to his theories. In the central role of Thor Heyerdahl, Pål Sverre Valheim Hagen must carry the story, and he does. His re-creation of the historical character is convincing as the embodiment of determination, not quite obsessive but coming close, as he plans, argues and cajoles to try to turn his project into a reality. As his fellow Norwegian crew members Odd Magnus Williamson as Hesselberg, Tobias Santlemann as Haugland, and Jacob Oftebro as Raaby are equally credible figures: young, heroic, and willing to give Heyerdahl their trust. Playing the only non-Norwegian in the group, Gustaf Skarsgård as Bengt Danielsson is a little detached, but perhaps even more intellectually committed than the others to what they are about. For contrast and drama, the filmmakers apparently took liberties with the character of Herman Watzinger, played by Anders Baasmo Christensen. Christensen does well with the part given him, although the real-life Watzinger was almost certainly stronger and more competent than the movie shows him. Given that she must play an ambivalent role, Agnes Kittelsen as Liv gives a very effective performance as Thor's wife and the film's only prominent female character. Gorgeous photography and great production values set Kon-Tiki off. The Pacific Ocean scenes were actually shot in the waters off Malta, the tropical ones in the Maldives and Thailand, with other locations in Norway and the U.S. used as appropriate. It is a real accomplishment that even with the limited space of the raft cinematographer Geir Hartly Andreassen never lets it become visually boring. Going from the micro to the macro, he manages to keep interesting also the vast empty spaces of the ocean, which emerges as a living character in its own right, often peaceful, sometimes petrifying, always powerful. 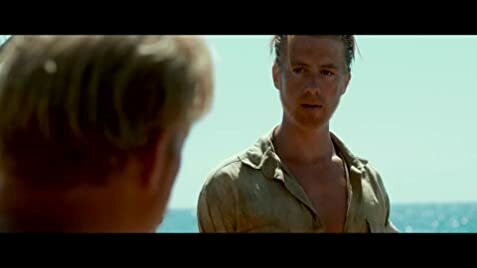 It must have been a temptation for the directors and principal screenwriter Petter Skavlan to fictionalize Heyerdahl's exploits and to create a stunning action/adventure tale on the lines of A Perfect Storm or White Squall. Thankfully they recognized that Heyerdahl himself was a character larger than life whose daring voyage became an extension of himself and his ambitions. In doing that they keep alive the iconic figure that he was, and give audiences some appreciation of how the sheer willpower of one individual can produce deeds that capture the imagination of the world.